If you want great quality bread but are not an expert, deciding on the right loaf pan to buy can be difficult. You will definitely be looking at affordability, durability and performance. 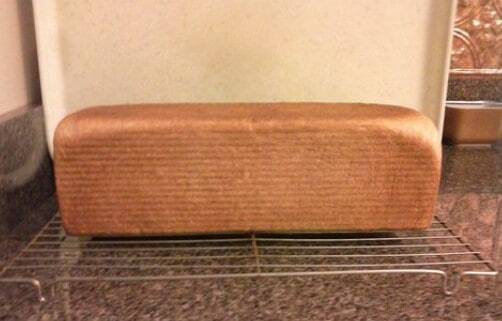 Read our USA Pan bread loaf pan review to find out what you should expect. Where is USA Pan Made? USA Pan is not just a marketing name. The pans are indeed made in the USA! The company behind them, aptly named USA Pan, is the sole manufacturer of commercial bakeware in North America. Located in Pittsburgh, PA, USA Pan manufactures superior commercial bakeware for companies such as Bimbo, Weston, Wendy’s, Burger King, McDonald’s, Sunbeam, Flowers, Merita, Wonder, Interstate Bakeries, Pepperidge Farm, Sara Lee and others. The company has been in business for over 50 years and have set the standard with commercial bakeware. The same silicone coatings, gauges, materials and corrugation (textures) that are used to make commercial bakeware are used for the USA Pan loaf pan. Professional bakers prefer bakeware made of aluminized steel. This material is durable, does not corrode and has excellent heat transfer properties. 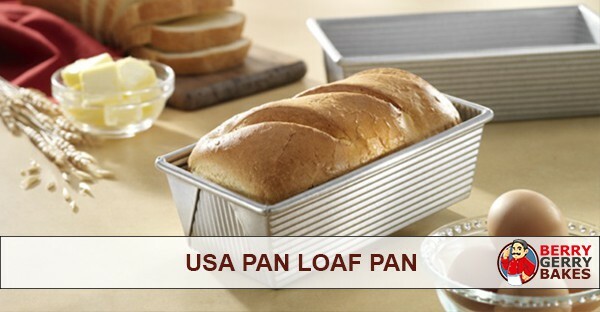 USA Pan Pullman loaf pan and other USA bakeware are made using 65% recycled steel. The gauges used to make USA pan bakeware mini loaf pan and the Pullman loaf pan are strong and durable. The pans are also incorporated with a wire in the rims to enhance their strength and prevent warping. Why are most USA bakeware corrugated? Are corrugated pans really better? Commercial bakers have always preferred bakeware with corrugated walls as they are stronger to handle frequent baking sessions and can resist the expected impacts in the kitchen. The corrugated walls enhance the baking process by allowing air to flow under the baked bread. Finally, the bread can easily release after baking since there is less contact between it and the pan. USA bakeware are coated with Americoat, a silicone based non-stick material that is easy to clean. The material is BPA-free, PFOF-free and PTFE-free and features the same high-performance standards required for commercial bakeware. The USA Pan nonstick loaf pan is perfect for making different types of bread, including gluten-free, milk loaves, rye sourdough Danish Rugbord and whole wheat varieties. The loaves of bread come out a beautiful golden brown color and there is no problem with sticking. The USA Pan Bakeware is one of the best loaf pans on the market. 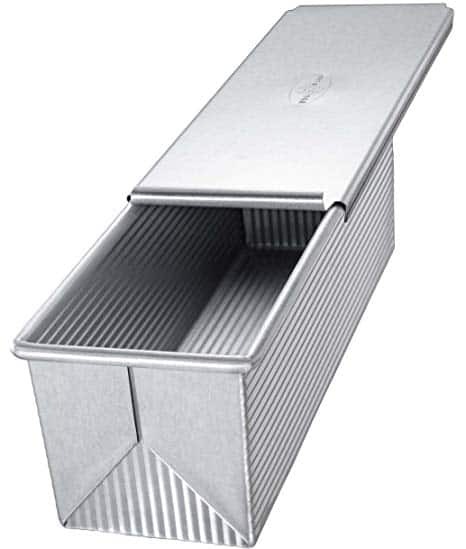 The pan is made of Aluminized Steel, measures 8.5 x 4.5 x 2.75 inches and can bake 1-pound loaf. If you are serious in baking the best bread, you are going to love the USA Pan loaf pan. Below is an overview of the pan. 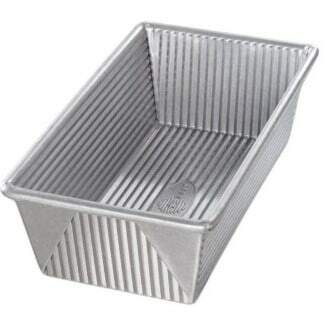 The size of the USA Pan bakeware aluminized steel 1 pound loaf pan makes it ideal for making loaves that are big enough to feed the whole family for one meal yet small enough to be prepared easily. This model comes from an American manufacturer with long-term traditions in the industry. 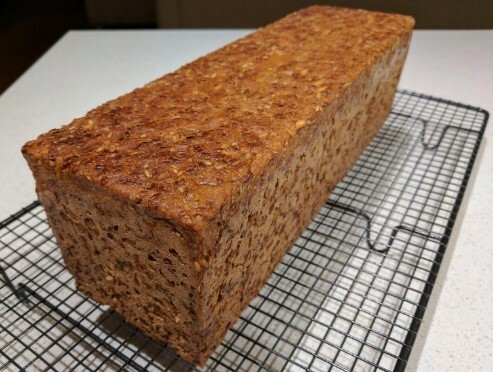 Americoat Plus nonstick coating – The non-stick coating makes it easy to release the baked bread from the pan’s surface without getting damaged. The non-stick coating is made from safe materials. If you are looking for a USA Pan loaf pan with cover, check out the Pullman version below. The USA Pan Pullman loaf pan with cover consistently bakes beautiful bread. The pan measures 13 x 4 x 4 inches, meaning you can get a 13” loaf. This is quite a big loaf. If you would be using a bread machine, you would want one that can bake large or extra-large bread, such as the Panasonic SD-YD250. This pan is made from commercial and heavy-gauge aluminized steel and comes with a lifetime warranty. The Pullman loaf pan is coated with a non-stick material known as Americoat that makes it easy for baked bread to slide out of the pan. The material also makes cleaning the pan easy. After baking, simply scrub any materials off the pan with a sponge or gentle scrub and wash with mild soap and hot water. The USA pan nonstick Pullman loaf pan with cover will help you get a square bread easily. After baking, you can slide off the lid without any issue. To remove the cover, wait for the pan to cool and then hold it so that the lid’s edge that curls up is facing you. From there, tap the curved edge with the palm of your other hand to get the cover to slide away from you. To replace the cover, slide it over the top edge of the pan, starting with the edge that curves up. Push the cover all the way so that the small indentation on it locks into place to prevent movement while baking. You can read more reviews of the USA Pan Pullman 13 x 4 nonstick covered loaf pan on Amazon. USA Pan Bakeware is an amazing pan to use at home. You can use the pan to prepare, delicious and aromatic small, medium and large-sized bread for yourself and the family.